Today we are going to do a chocolate body wrap, including exfoliation with home made coffee scrub and finishing with cocoa cream and massage! Don't drink alcohol and don't use another intoxicators 48 hours prior the treatment. Drink enough water as the treatment may cause dehydration. At least have a glass of water after the treatment. Cocoa beans have a very rich biochemical composition: each bean contains more then 800 molecules with hydrating, regenerating and revitalizing properties. 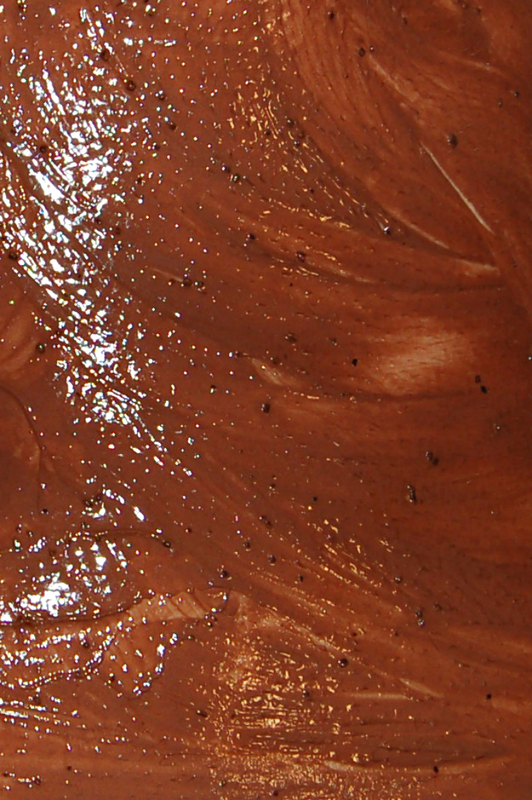 Cocao is a source of mineral salts, iron, magnesium, phosphorus, potassium, calcium vitamins and proteins. It contains active agents such as polyphenols, which are very powerful anti-oxidants, flavonoids, which effectively protect blood vessels, and theobromine and caffeine, which are great stimulants. Cocoa is a very effective anti-cellulite substance and helps to reduce water retention and the "orange peel" effect appearance on the skin. We are using caffeine scrub for exfoliation as a first step, since caffeine works to increase blood flow and stimulate adipocytes to release fat into the bloodstream so it can be burned by body's metabolism. In simple terms Caffeine helps to drain body's fat cells. Also, Caffeine tightens and tones the skin, helping to reduce the appearance of cellulite. When applied topically it works as a lipolitic agent, breaking down the fat tissue and causing localized weight loss. 2. Coconut oil (Marina loves it, so we will use it on her. I consider my client's preferences:). 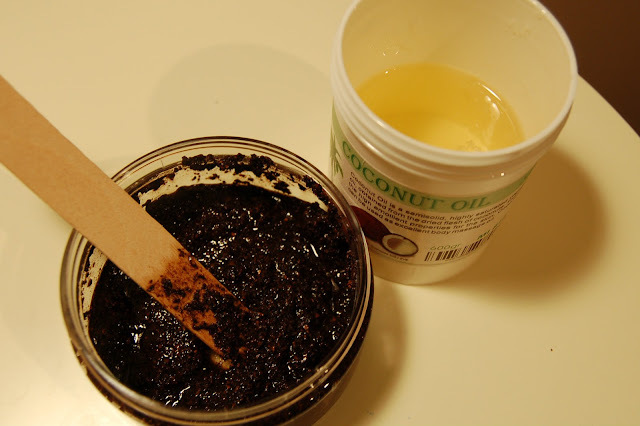 Also can use Sweet Almond oil, Grapeseed oil, Mineral oil, Olive oil or honey. 3. 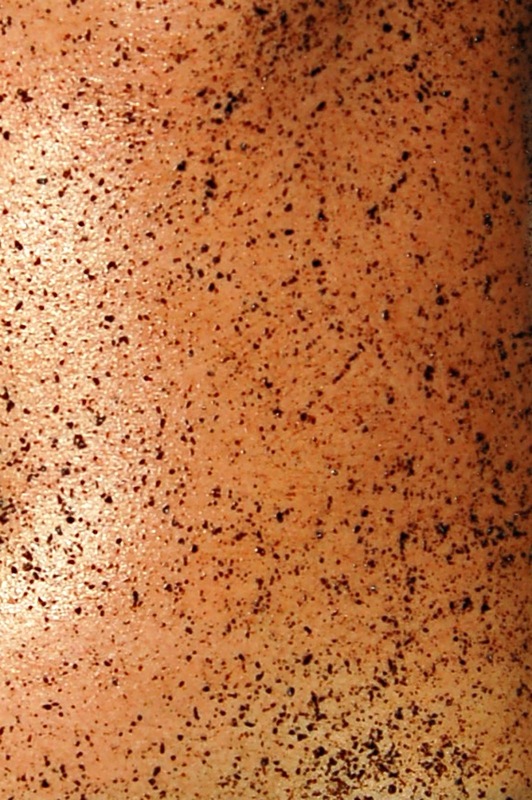 Essential oil Cinnamon, which helps to strengthen and tonify relaxed tissues. Also can use Grapefruit, Juniper, Rosemary, Bergamot and Cypress. I think cinnamon makes the best combination with coffee. 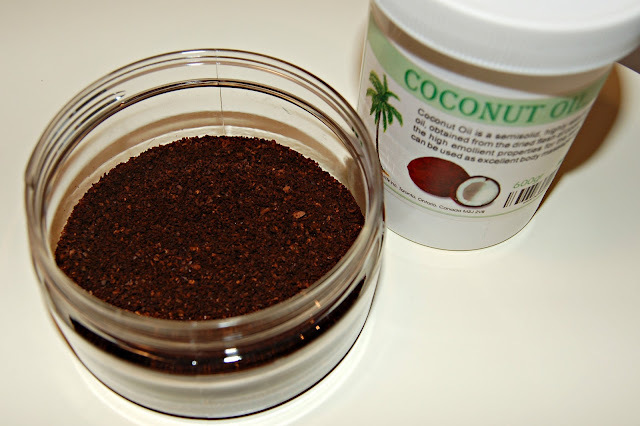 Mix approximately 100g of grounded coffee with coconut oil. Then add 8-10 drops of cinnamon oil to the mixture. Apply scrub in circular motions. (Before application I prefer to leave a hot towel on the skin to open up the pores). Scrub for about 5-10 minutes. Then wipe residue with warm towel. For home care i suggest to use scrub 2-3 times a week. It can be stored in the fridge. For the wrap we are using Dolci Belezze (Sweet Beauty) chocolate cream, made in Italy. Active ingredients include: Caffeine, Ehinacea, Algae Spirulina. Professional product sold through salons/aestheticians only. Great product, (I love) smells like chocolate works like miracle) I also add a few drops of concentrated tonifying synergy, which will help to firm the skin even more. Apply chocolate cream on the skin. 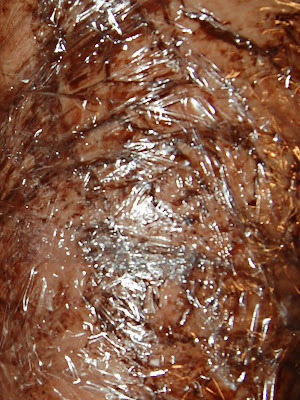 Then wrap with plastic film. After 30 minutes I remove residue cream with warm towel. 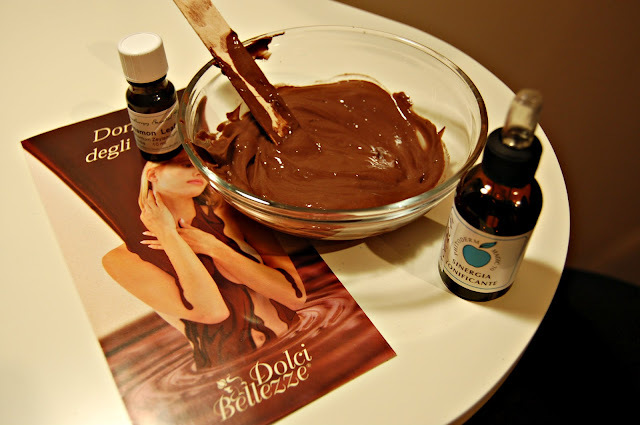 Apply Dolci Belezze Cocoa cream with heating effect to skin, and massage it in. Marina: I'm dieting permanently, and don't exersise as much as I have to. It causes loss of muscle mass and turns me into a fat-skinny. That's why massage and a nice toning wrap are so beneficial for me. It helps to tone the muscles and reduce cellulite. Treatment has contraindications and precautions. For rates and inquiries please contact us at torontolookbook@yahoo.ca.